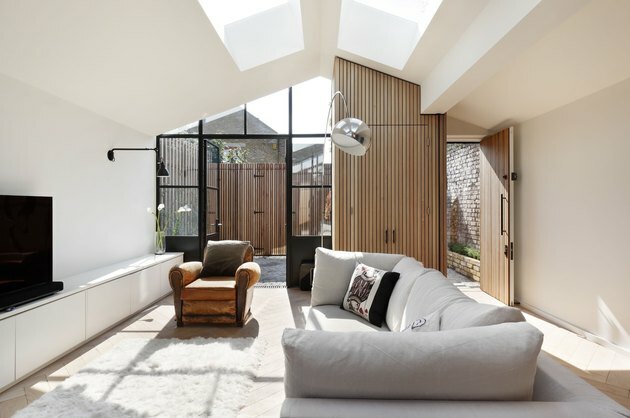 Before converting a historic West London shed into a contemporary house for a family, Max de Rosee of De Rosee Sa Architects made the decision to view the strict planning regulations of the site as creative challenges: "We worked very hard in the initial stages to convince the clients that developing this house was a risk worth taking," de Rosee said. "We had to convey its potential." 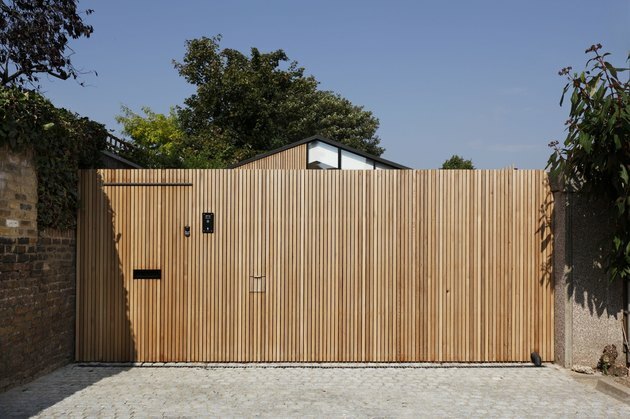 Inspired by the structure's historic site (a former wood yard between a row of West London garages) the firm used wood materials that reference the site's lumberyard past; the walls of the courtyards are clad in Western Red Cedar, and the interior features wood parquet flooring. 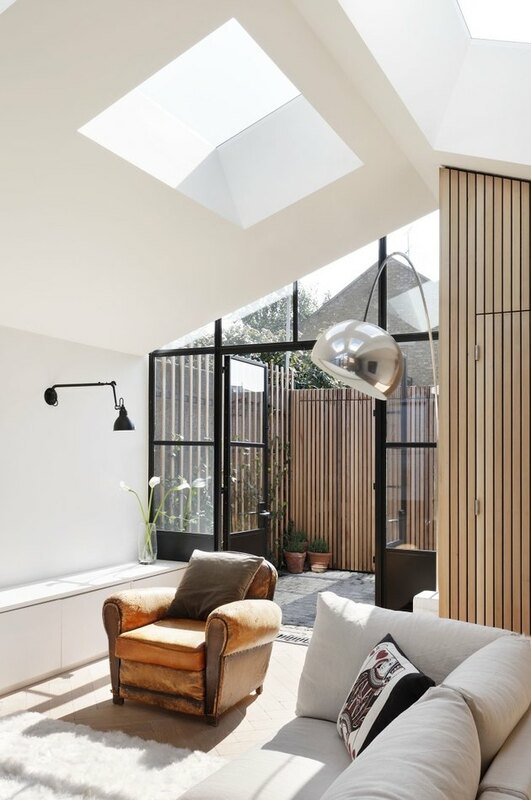 Crisp white walls and large windows, which can be opened to the courtyard during the warmer months, give the narrow home a spacious appeal. 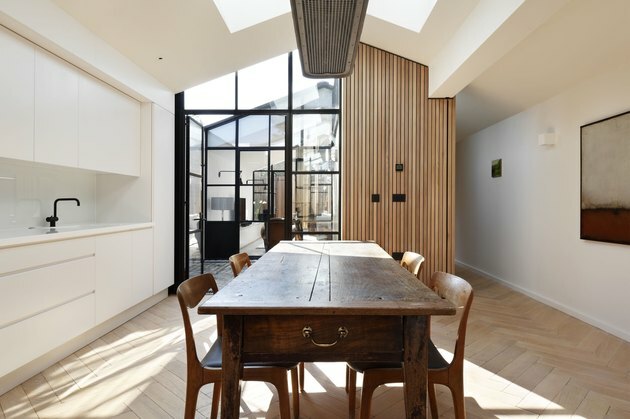 "The most satisfying aspects of the project is the top light that pours into the interiors and the long views through the courtyards. Once inside, you forget that this house is in London," de Rosee said. 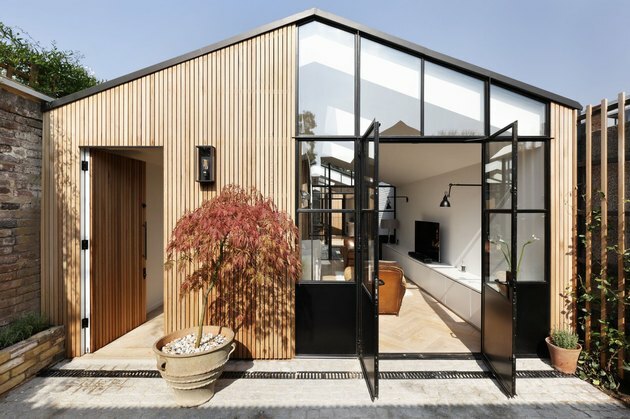 One of the regulations, which insisted that the vertical limit match the existing height of the shed (a single-story building) meant that the firm had to devise a way to build more space in the existing footprint. Now measuring more than 1,100-square-feet, the building features a basement level with an accompanying external bathroom and private courtyard. Three external courtyards surround the structure, allowing light to flow freely throughout the space. The interior and exterior design elements are unified by strong vertical architectural lines. Three external courtyards were added in order to provide the space with a plethora of natural light, giving the family plenty of privacy without sacrificing views of the outside. Timber parquet flooring from Simon Barber provides the perfect natural appeal for a house located in a former lumberyard. In another ode to the home's industrial past, the doors and windows from D&R Design are made of steel. In the living room, the clients' furniture collection, including a sofa and armchair owned previous to the build, is on full display. 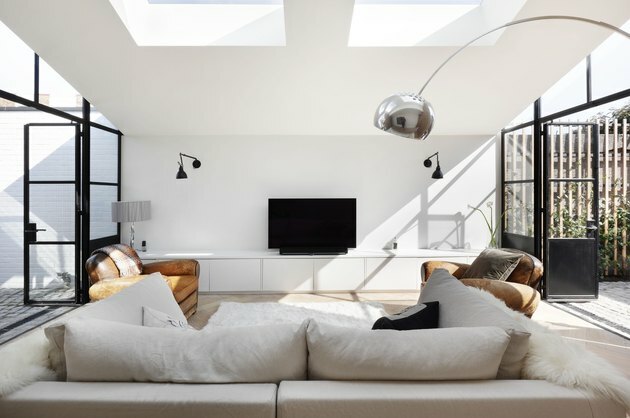 A large, metallic lamp reflects light from the skylight and windows while the furniture textures, soft and natural-toned, absorb light and exude coziness. 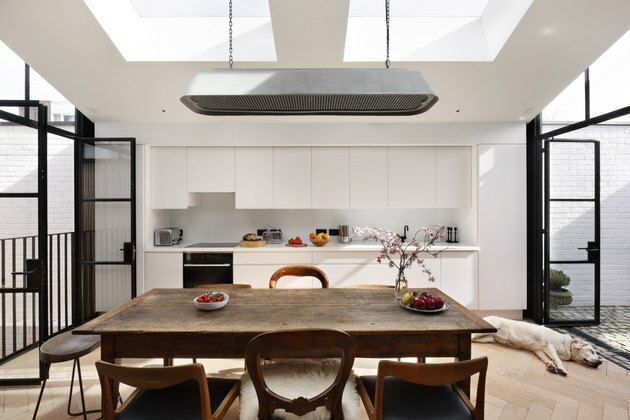 White walls in Bianco from Fired Earth provide a backdrop for oak wood floors and a bespoke kitchen. Over the table shines a ceiling light from Holloway's of Ludlow, a retailer specializing in unique contemporary lamps. The client owned much of the furniture before the build, including the beautifully constructed dark wood dining table surrounded by chairs made from the same material. 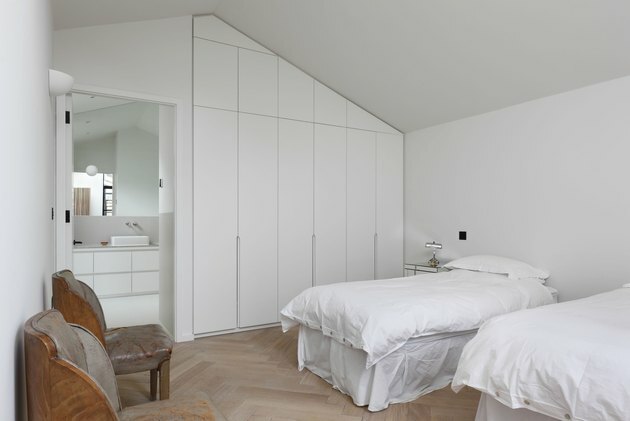 An all-white bedroom is a departure from the rest of the home design, yet the room still features the vertical lines that can be found throughout. The custom closet follows the shape of the house. 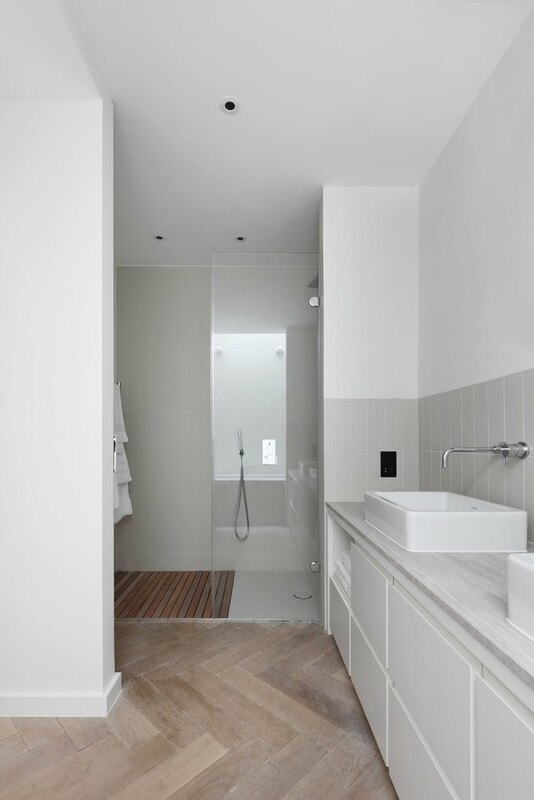 The bathroom maintains a minimalist vibe with wood details contrasting the mostly white theme. A classic, rectangular Vero sink by Duravit is complete with a Kai Lever faucet set by Crosswater to complement the bathroom's minimalist style. The facade sets the tone for the design — a space where natural and industrial meet in a simple structure.